We all know what happens when a car component fails. On some days, it might just cause the car to stop working. However, on other, and more unfortunate days, it can cost someone’s life. When it comes to the automotive industry, people often associate words such as, “luxurious”, “premium” and “outstanding quality” when they think about Mercedes-Benz. This brand connection still holds true today. The Three-Pointed Star brand in Malaysia also manages the wholesale distribution of Mercedes-Benz, smart, and Mitsubishi FUSO brands nationwide. Delivering “the best or nothing”, Mercedes-Benz continues to strive in providing unparalleled products, or in other words mercedes benz spare parts and customer experiences in terms of overall vehicle quality, spare parts, and services in Malaysia. Genuine spare parts are vital for optimum vehicle performance. Hence, Mercedes-Benz will never compromise on this. Aside from elegance, prestige and outstanding performance, Mercedes-Benz vehicles are also known for its high-levels of safety. All genuine Mercedes Benz parts undergo strict and vigorous tests to mimic real life driving situations under extreme conditions before they can be labelled as “Genuine Mercedes Benz Parts”. For your safety, and the safety of your Mercedes, Mercedes-Benz place special emphasis on the spare parts’ functionality, operating life and load capacity. For example, when paired with authentic Mercedes-Benz brake discs, Mercedes-Benz genuine brake pads offer high braking powers even at short stopping distances. Low wear and tear also prevents brake noises from happening. Also, genuine Mercedes-Benz engine oils, which are only available at authorised Mercedes-Benz dealers, provide reliable lubrication for every situation and extends engine life. 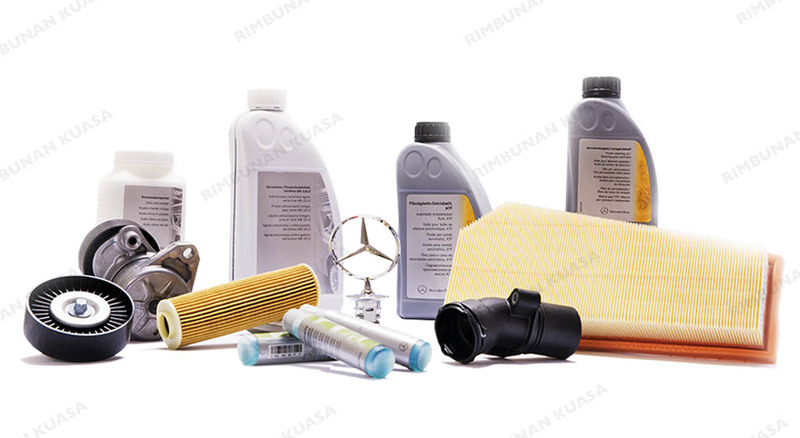 As one of the reputable authorised dealers for genuine Mercedes Benz spare parts in Malaysia, rest assured that Rimbunan Kuasa Sdn Bhd offers genuine and authentic spare parts for your Mercedes. From genuine Mercedes-Benz oil filters to genuine Mercedes-Benz screen wash, we got you covered.